Fire Birds flies back onto Blu-ray seeking to do right by fans searching for a rip-roaring 80s action yarn about American's war on drugs with Apache helicopters. The film is still a silly mess and you're either going to love it or hate it depending on your proclivities. Kino Lorber Studio Classics almost makes up for the terrible Mill Creek release. Unfortunately the same video master was recycled, however, there are two brand new audio tracks to chose from and a pretty great commentary track from director David Green. It's not a slam dunk release, but it's the best one yet for Fire Birds. For Fans Only. "I AM THE GREATEST! I AM THE GREATEST! I AM THE GREATEST!" You can check out my review of the 2015 Mill Creek release HERE. When I first took a crack at Fire Birds on Blu-ray in 2015, I was operating on a few scant memories of catching the film on television when I was eight or nine years old. I knew it wasn't going to be a great movie by any stretch, but I was hoping for something fun. If you look back at my old review I really took it to task and a lot of my gripes with it still stand. But looking at the film again for this Blu-ray release, I feel like I finally get the joke - whether it was intentional or not. 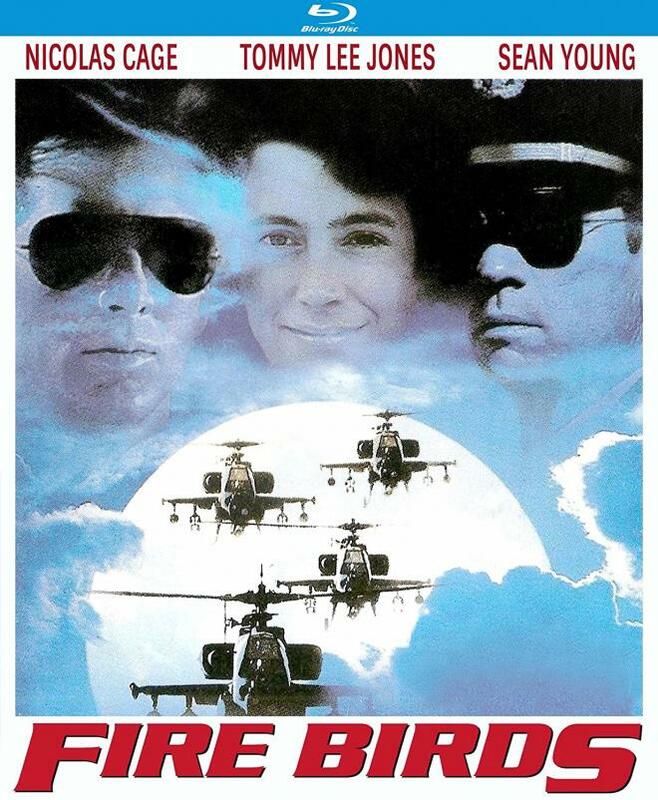 David Green's 1990 War on Drugs fantasy -- featuring Nicolas Cage, Sean Young, and Tommy Lee Jones as ace Apache helicopter pilots -- still isn't a great movie, by any stretch, but it's grown on me and proved to be an entertaining romp. How well you actually settle into enjoying this movie will probably hinge on how much you enjoy Nicolas Cage. Yes, during the long long ago there was a time when Cage was a respected Oscar-winning actor and a box office draw. But he was still Nicolas Cage and all of the actor's abilities to go fully over the top are on display in Fire Birds. He's smarmy. He's got a weird pseudo-southern accent. He yells - a lot. And he chews so much scenery there's little left for the rest of the cast. Toss in Tommy Lee Jone's signature authoritarian order-barking with Sean Young reading her lines off cue cards and you're in for a rough time - but it's all in good fun. The film really comes to life with the crazy action sequences. 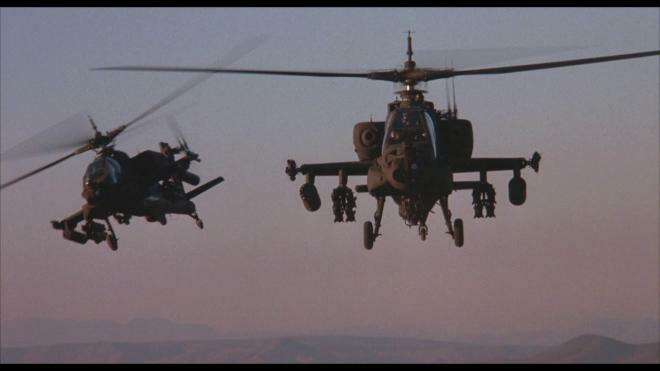 I've long loved helicopter combat movies; I have great memories sitting on the edge of my seat as a kid watching Blue Thunder for the first time with my dad. Hell, I even got a kick out of the insanely silly and out of place helicopter chase sequence in Outbreak. But when it comes to that sort of aerial combat, Fire Birds takes the cake. This film aims to do what Top Gun did for fighter jets but doesn't manage to get a tenth of the action movie muscle out of its signature vehicle. It's a glorified puff piece about American military might painted against the backdrop of a piece of foreign policy. One could knock Fire Birds for pure blind jingoism if it wasn't for how damn silly the whole thing is. Yes, it aims to highlight America's ongoing drug wars with Central American cartels, but you can't take it seriously when everything looks like it was shot in the American South West. At least Rambo: First Blood Part II tried to look like the jungles of Vietnam. When you see helicopters pulling all sorts of aerial stunts over territory that looks like they're a few miles from Vegas and could drop in and check out a show; suspension of disbelief is, to say the least strained. In fact, with its paper-thin plot, most of the film looks like it belongs at a big trade show. "See what our new helicopter can do! Thank you, Nicolas Cage!" You're either a fan of Fire Birds or you're not. It's not a film everyone will love and those who do come to enjoy it will likely get a kick out of it for all of the wrong reasons. It's hardly an example of prime action/adventure filmmaking. That said, if you like your action movies with a thick layer of canned instant cheese, Fire Birds is a fun time. I still don't love it. I still think it isn't nearly as good as it could be and my nostalgic glasses are far rosier than reality. However, in the time since my last viewing, this weird little movie has grown on me. It's little more than 90 minutes of action silliness and if you're in need of diverting entertainment, you get what you pay for. Fire Birds attacks Blu-ray for the second time, this round courtesy of Kino Lorber and their Studio Classics label. Pressed onto a Region A BD-25 disc, the disc is housed in standard sturdy Blu-ray case. The disc loads directly to a static image main menu with traditional navigation options. For the 2015 Mill Creek release of Fire Birds, I pretty much shredded that transfer. As this 1.85:1 1080p is virtually the same thing repackaged for this release, I feel I may have been a bit harsh on that release, but it still is incredibly problematic. Softness, fluctuating detail levels, DNR, inconsistent grain, colors, flatness, black levels - everything that was a problem then still is today. However, watching it again you can see that the image does have some decent moments. 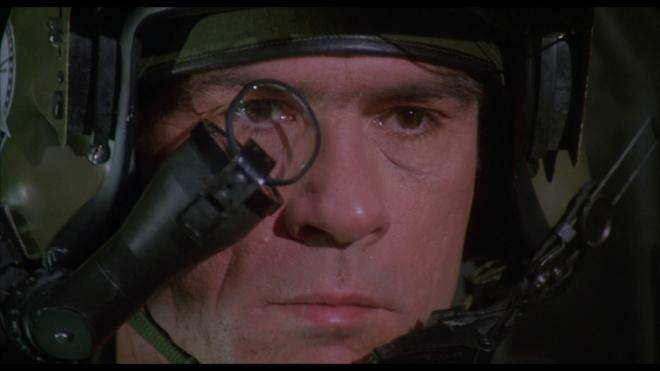 Close-ups and middle shots that take place outdoors on the military base are still the best looking shots of the film. Indoor sequences can look rough exhibiting the worst examples of flatness, dull black levels, and obvious smoothing. When Kino Lorber announced that they were getting this film I was very hopeful that they'd give the show a new scan or remaster, but sadly that didn't happen here. There are some scenes that pass, but it's still an ugly mess. Where Kino Lorber was able to knock it out of the park for this release was in its offering of two audio tracks that easily replace the dismal Dolby Digital 2.0 track Mill Creek issued. Here, we're given a strong and healthy English DTS-HD MA 2.0 mix as well as a robust and active English DTS-HD MA 5.1 track. It doesn't matter which one you choose, both of these tracks blow away that old mix and leave the smoldering wreckage in the desert to rust. Instantly you can hear a notable improvement in dialog clarity. Gone are the tinny and flat exchanges that sounded as if everyone recorded their dialog in an isolated booth through a soup can. Sound effects get a lot of extra punch and presence - the numerous scenes of helicopters zipping around the landscape firing guns and rocks with explosions are a real treat. Scoring by David Newman also enjoys a little more zest and gives the mix a little extra pop. Like I said, both are terrific tracks so it's a dealers choice which one you choose. The 2.0 track is probably a little more organic sounding, but the 5.1 mix gives a nice spread to the soundscape with good spacing and atmosphere around the elements. I liked the 5.1 mix better, but the 2.0 track is just as aggressive and impressive. This bonus feature package for Fire Birds may not be the most impressive thing ever assembled, but it's at least better than the big fat nothing that was on the previous disc. Audio Commentary featuring director David Green - Green offers up a great amount of background to the film and the production while delivering some good scene-specific notes. It's maybe not the greatest audio track ever but it's informative and he's got some good stories to share. No, Fire Birds is not a great movie. It still feels awful late to an action movie party that had started in the 1980s and amounts to little more than a pale Top Gun knockoff. That said, it's still a weirdly engaging and entertaining movie that's actually grown on me over the last couple years. Watching Nicolas Cage yell most of his dialog is a real eye-roller but it's the kind of fun you expect from the actor. The helicopter dogfights are the star of the show, so on that level the film delivers. Kino Lorber Studio Classics rights some of the wrongs left by Mill Creek in 2015. While the same problematic video transfer was recycled here, the new audio tracks are a massive improvement and the included director's audio commentary at least gives fans something extra. This is a tough movie to suggest people pick up, but if you love the movie warts and all, this release from Kino is the best you're going to get for awhile. Fire Birds is For Fans Only.